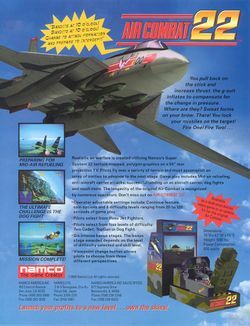 Air Combat 22 is a combat flight simulator arcade game that was released by Namco in 1995; it runs on Namco System 22 hardware, and as the name suggests, it is the sequel to Air Combat which was released three years earlier. In addition to the game being sold as a dedicated sitdown cabinet, there was also an update kit that could be used for converting existing sitdown cabinets of its predecessor. The player must take up control of one of three different aeroplanes (one of which is the F16 from the original), through three new stages of play (Two Cadet, Top Gun, and Dog Fight); there are also six new bonus stages, two of which will appear between the regular ones (and will get determined by the level of difficulty and player's skill), as well as a "viewpoint change button", which allows the player to choose from three different perspectives. The amount of enemies remaining on the current stage will also be displayed up in that top-right corner of the screen - and several new features such as mid-air refueling, landing on aircraft carrier ships, and anti-aircraft carrier attacks have also been introduced.